For driving pleasure in two worlds: whichever engine you choose, efficiency and performance are the hallmarks of all four diesel and petrol engines in the BMW X5. Two TwinPower turbo engines are available for the petrol models (xDrive 50i and xDrive35i). The eight-cylinder in the xDrive50i brings smoothness to the roads while the straight six-cylinder in the xDrive35i impresses through efficiency. When it comes to the diesel engines, the xDrive30d is the most efficient common rail diesel engine in its class. Equally efficient, yet with increased propulsion, is the final member of the engine quartet, the xDrive40d. All four engines feature the latest generation of BMW EfficientDynamics – a range of efficiency-increasing technologies that are implemented throughout the entire vehicle. The turbocharger with adjustable turbine geometry, the engine electronics controlled in parallel by several processors and the precise and fuel-saving direct petrol injection are just a few of the sophisticated technologies on offer. Heading towards the sunset or illuminated by city lights: the BMW X5 instinctively draws gazes wherever it goes. Its long wheelbase, short overhangs and powerful contours express its elegantly sporting nature. 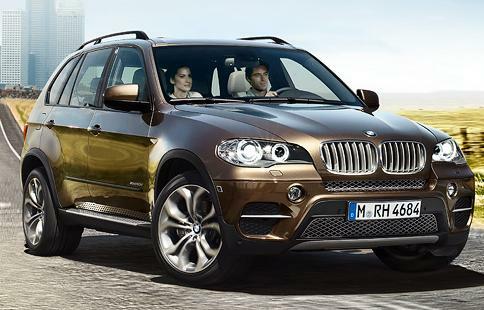 Prominent lines and sculpted edges are testament to the BMW X5's unmistakable presence and elegance. The front apron is almost entirely in body colour, and the dominant air vents and elegant matt-silver finished mouldings direct the viewer's attention to its wide stance on the road. The muscular, sculpted bonnet is a clear indication of the power that lies beneath while the dynamically contoured sides and L-shape rear lights with LED technology underscore the vehicle's elegance. The front and rear matt-aluminium finished scuff guards and the newly designed exhaust pipes complete the athletic and powerful appearance of the BMW X5's exterior. Whether captured under city lights or beams of sunlight, the design of sporting intent has never been so intensive. Athletic performance and comfort are no longer mutually exclusive: if desired, Adaptive Drive combines the two active chassis control systems Dynamic Drive and Dynamic Damping Control for a more relaxed driving experience. Adaptive Drive includes an individually selectable setting for the dampers. Supported by Dynamic Damping Control, Dynamic Drive ensures that active stabilisers on the front and rear axles deliver an outstandingly smooth ride and enhanced agility. A clear view in clear situations: up to five cameras give the BMW X5 a clear view of any situation. Two front-end Side View cameras are integrated in the front bumper, one on the left and one on the right. Both images are displayed in the Control Display to give you a clear view when carrying out parking manoeuvres. The Rear View camera also provides welcome support when parking. Interactive lane lines in the image inform the driver whether or not the parking space is large enough. The zoom function allows you to adjust the image so that you can attach a trailer to the tow bar without the need for further assistance. The Top View cameras in the wing mirrors complete the camera package. Together with the data from the Rear View camera the system generates a bird's eye image of the BMW X5 and its current location. Whether you are entering or leaving a parking space, carrying out every manoeuvre is simple and safe. A vehicle as flexible as you are: a third row of seats is quickly available whenever you need it. The two addition seats face forward and can be adjusted individually. And so that your extra guests feel completely comfortable there is also an additional heating unit for the footwell of the third row of seats. Enjoy complete comfort on every journey: whether on a long trip to your holiday home or on a business trip to another city, the comfort seats for driver and front-seat passenger never fail to impress.